Mariam Navaid Ottimofiore is a Pakistani born expat who grew up in Bahrain, New York City and Karachi. She has been living abroad for 17 years, with her husband and her two children. She has presently just left Dubai and moved to Ghana. I met her at the Families in Global Transition (FIGT) conference in The Hague, Netherlands in 2017 and was delighted when I realized that at the 2018 conference (which I unfortunately could not attend) she held a session to introduce the topic of The ‘Other’ Expats – Diverse Voices from Dubai; How Race, Class and Privilege Affect Our Mobility Experience. I talked to her on the phone about it over the summer and our conversation confirmed the impression I had after meeting Mariam: she is a very empathetic, highly motivated person, who believes in the power of our expat lives to change the world around us. Thank you Mariam for your time and best wishes for your next assignment! Mariam had been an expat for many years, but it was only when she moved to Dubai in 2014 that she realized that a huge portion of expats were not part of the mainstream discussion on global mobility. These were the construction workers, the labourers, the gardeners, the maids, the nannies and the taxi drivers who hailed from countries like Pakistan and the Philippines. Many of them had migrated to the United Arab Emirates as foreign labour. 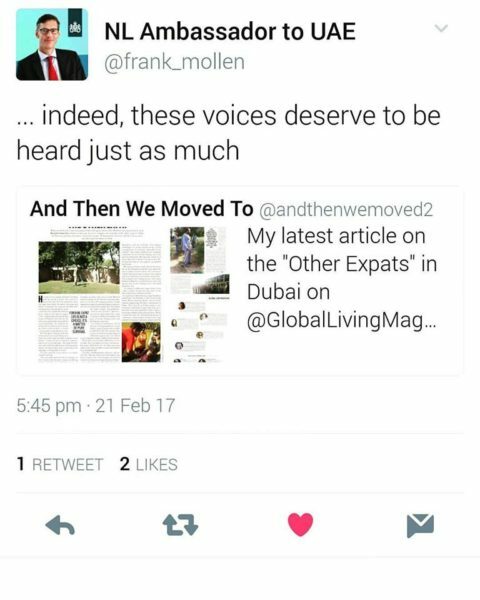 She started researching and writing about these ‘other’ expats in 2016 to give a voice to this group of unheard and unseen foreigners who, like her, had settled down in Dubai, though under very different conditions. 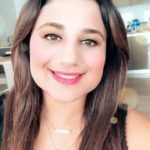 Mariam started precisely from the fact that both she and these other expats had one big thing in common: they had both left their home countries and were living and working in a foreign land, which they both had to adapt to. In this process, she found out, that despite the big gap in economic conditions and socio-economic statuses, the ‘other’ expats faced many of the same challenges as the traditional expats: dealing with homesickness, culture shock, transitional pain, hope for better conditions, were all commonalities that mark all adaptation phases to new countries. And yet, these people were not considered expats. In Dubai, an expat was a German marketing executive, not a Pakistani construction worker. The latter was called a ‘migrant worker’; a term that in the Middle East is used widely to denote individuals with blue collar jobs who come over to work for time-limited periods but are never integrated into society. They lead a very different life from the richer expats who arrive in the country with a solid working contract and loads of benefits. The ‘other’ expats have no access to relocation agencies, financial services or any form of governmental assistance. They leave their families back in their home countries and work hard to send money over to them every month. The financial conditions of the groups are striking, says Mariam. Whereas an expat working for a big international company is likely to earn 12,000 USD per month, the ‘other’ expats, mainly employed in construction and the labour industry earn around 190 USD per month. Mariam was surprised when she realized that in Dubai, the two parallel worlds exist side-by-side, but rarely do they ever cross. Most expats live in their cocoon, and they might find it difficult to register that other people live in such difficult conditions. Mariam had been deeply touched by Amanda Bates intervention at FIGT17 when she had asked “who is not at the table?”, where attention was driven to the fact that those who own and lead the discussion about mobile life issues are mostly Third Culture Kids (TCK’s), diplomats, missionaries, expats, relocation agencies and international corporations. What about the refugees, the displaced and the migrant workers? Didn’t they deserve to be at the table too? Mariam presented the results of her work at FIGT18 (click here to see the full video), but that was not the end of her work to bring awareness to the ‘other’ expats. She continued writing about the ‘other’ expats, blogging about their stories, advocating that the word ‘expat’ be redefined to include the ‘other’ expats (read here). She also collaborated with local initiatives such as the growth platform RISE who help these ‘other’ expats in the UAE to open up bank accounts, manage their finances, learn new skills and build a better future. You can read her article on RISE on And Then We Moved To. “All this has spurred a lot of expat writing, and organizations that help “other expats” have gained exposure. New collaborations and ideas exchanges have been born. Many expats in Dubai have approached the discussion, and ask themselves what they can give back to this country”, says Mariam. I am delighted to hear all this. It is high time that more expat voices get together to realize how privileged some of us are, and how much we miss in not taking into the picture the stories of other expats. “We should start by bringing equality in the language”, says Mariam. “If you give them the same name as you call yourself, you open the way to find commonalities, and not differences”. I ask Mariam if and how she intends to continue the project. She tells me that she will continue to do whatever she can to break down barriers, to challenge people’s minds to open up and embrace differences. There is a lot of work to do because the inequalities are mind-blowing. I am confident that Mariam will find her way to help people move forward wherever she goes. And I thank her from the bottom of my heart for this. 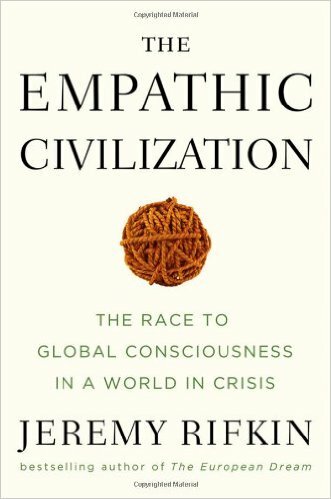 Francesca sends us this recommendation for the book The Empathic Civilization, interesting food for thought from sociologist and economist Jeremy Rifkin. Human beings have many things in common, including a deep-rooted instinct for social relationships and the ability to form a new consciousness, both global and collective. Simply the act of reading an account of this kind means testing our preconceptions about human beings and trying to consider events and phenomena from another perspective: one that views our fundamental nature as human beings in a different way. Here’s what Francesca has to say. This book takes us on a fascinating journey through human evolution, a journey covering ground that our collective sentiment, for the most part, has not yet explored. 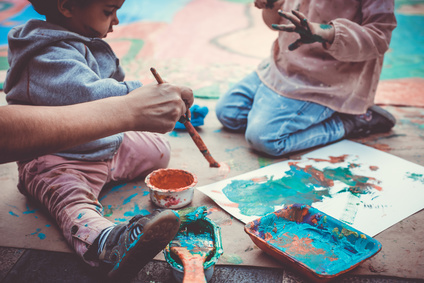 The discovery of mirror neurons – so-called empathy neurons – during the 1990s offers a completely different interpretation and is leading scientists from a wide range of disciplines to rethink the theories that characterized the age of reason. Today the cognitive sciences seem to recognize that the most profound human instinct is not the anticipation of pleasure, nor even the struggle for survival or the selfish fulfillment of our own needs, but rather the creation of social ties. Rifkin takes us back through the biological, economic, cultural and social history of humankind, which is being rewritten by the scientific community of the present day. Our modern, technologically advanced civilizations have led to an unprecedented mixing of peoples and expansion of consciousness, but not without consequences. The path of this new ‘homo empaticus’ is, in particular, characterized by the empathy/entropy paradox – the gradual deterioration of a system to the point where it is no longer possible to replenish the energy it uses. Our huge consumption of natural resources is leading to the depletion of these same resources. Never before have we been as aware of what we are, never have we been as clear about our potential for developing a new consciousness, both individual and global, as we are today. Yet all this is made possible by our greater and greater consumption of the planet’s energy and natural resources. Will what Rifkin describes as humanity’s ‘biosphere consciousness’, an awareness of ourselves as part of the earth’s system, be able to guide us towards the solution to this paradox? Will we manage to reach the level of global empathy needed to save ourselves and the earth that is our home in time? The human race is facing the most important challenge of its existence. This book has affected me deeply. In practice, it’s science telling us we’re better than we had always thought. This can only fill me with faith and hope that things can improve for us and for this world of ours. It won’t be easy, but it’s certainly possible. And this can come about not by denying who we are, but instead by following and listening to what, it turns out, is our true nature. For some cultures this has always been clear; we Westerners are finally getting it! 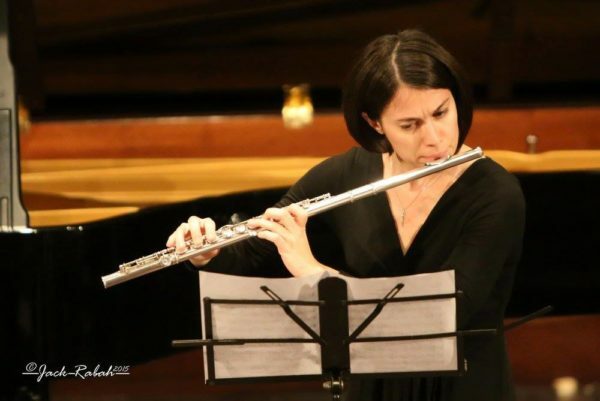 Claudia interviewed Nicoletta Zannoni, flautist and teacher, who studied music in Italy and presently lives and works in Ramallah, Palestine. Nicoletta participates in our monthly challenge with…music! I find that wonderful and a perfect example of the power of music. 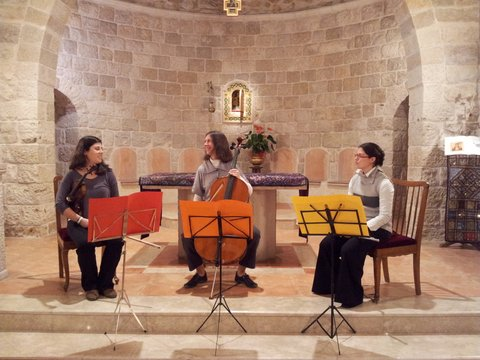 In your experience, is playing together influenced by the cultures that participate in the work? Will the result be different if a piece is played by people that come from the same national culture or by people who come from ten different cultures? I am talking about people in a group, let’s say as in chamber music, where there is no conductor, but where music is created by the members of the group relating one to the other. 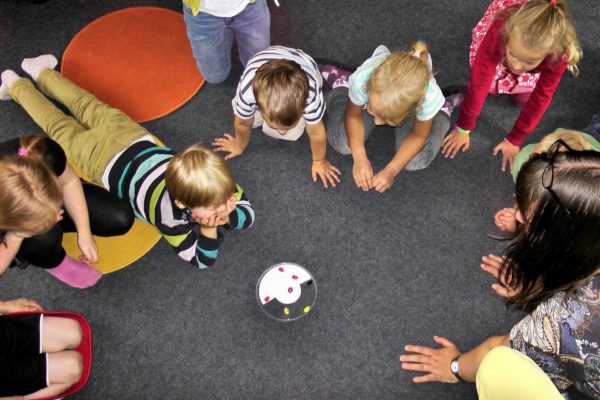 In playing together, as in any form of teamwork, the background of the participants certainly plays an important role. During rehearsal, different ways of thinking, different styles and techniques will emerge. The same passage will be interpreted in contrasting ways that will have to be harmonized. This allows us to learn new things while offering what we know, acquiring insights that may be very different from our usual way of making music – and this is why it is so good to discover these new ways: you would never otherwise have thought about them! In my experience, playing with people of different nationalities is very enriching; each one brings a personal and cultural contribution that is new to the other, and it is fascinating to put them together while yet not losing the richness each one expresses when playing or talking about the music of his culture or nation. I remember a concert with a Japanese colleague, and the preparation of some Japanese traditional songs…I still get tears in my eyes! Music works in many ways, and before “making” it, there is of course the listening. Letting oneself be touched by the music of a country – whether one is a musician or not – means going to concerts, turning on the local radio when one is driving, maybe listening to the music played in the gym, in the machine hall…I believe all this is the quickest and simplest way through which music opens a door on another culture. The first reaction will probably be of not being comfortable with what one listens to (I think in particular of the strong differences in musical systems, like moving from Western to Arab music for instance) and of feeling estranged… These sounds, however, will quickly become familiar and part of the landscape. I so much appreciate these comments because they are perfectly in line with the aims of our project, ‘What Expats Can Do’. The idea is to find ways to get closer to the cultures that host us, so that the unknown becomes more and more familiar and does not frighten us. We are convinced that music is a wonderful way to do it. In some situations it is also a great way to break down barriers and “universalize” feelings. You have played (and have led others to play) with people from many walks of life – would you say that music is a language that contributes to minimize conflicts? Music is certainly a language that helps different people and cultures to get close; sometimes it is more direct than a thousand speeches and declarations, because it touches a deep part in each one of us. However, it must be said that music alone is not enough: if two people with a conflict sit down and play together, and thanks to music can collaborate, this does not mean that the conflict between them is solved. It remains. But a work together has been done; one had to relate to the other: this could be the first step towards knowing the other and his story. So, it is true that music is very powerful in putting people in relationship one to another, but it is only the first of a series of steps that may in the end allow the breaking down of walls. Motherhood is something that always makes me feel close to women, no matter where they come from. Distance disappears when mothers talk about their children. 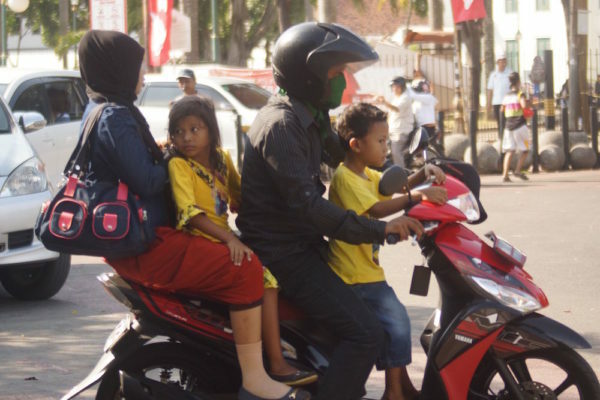 In Jakarta, where I presently live, there is a habit of travelling with the whole family on a motorbike – children included – often without helm, and this is something that makes me feel unease because I know I would never share a motorbike with more than one person, and certainly never put my small child on it without a helmet. But this is my way. I know there’s a wider picture. I wrote the story below in an attempt to identify myself in the feelings that go beyond the danger, and that are common to all families – love, warmth, sense of unity and belonging. ‘Open it!’ My mom’s eyes are glowing. I lift the upper part of the cardboard box and there it is, a bright new motorbike helmet, exactly like my father’s, orange with a black tiger on it, but smaller. “Happy birthday.” My dad grins. He knows how much I wanted it. Children’s helmets have appeared recently in Jakarta, and they are expensive. Still, we spend a lot of time on my dad’s motorbike, and we hold every object and rituals linked to it in high consideration. The roar of the engine interrupts the discussion, and my father heaves us onto the motorbike. He is the one who usually drives it, though my mom is not a bad driver at all, and occasionally takes the handlebars. We take our seats, trying all combinations: me and my sister sandwiched between Mom and Dad; Dad, me, Mom and my sister in the back; me in front, then Dad, sister and Mom. My dad is not keen on having me sitting in front. I don’t think he worries for my well-being, though. He probably wants to have a bit of free space to play with his phone at traffic lights. The trip is long. 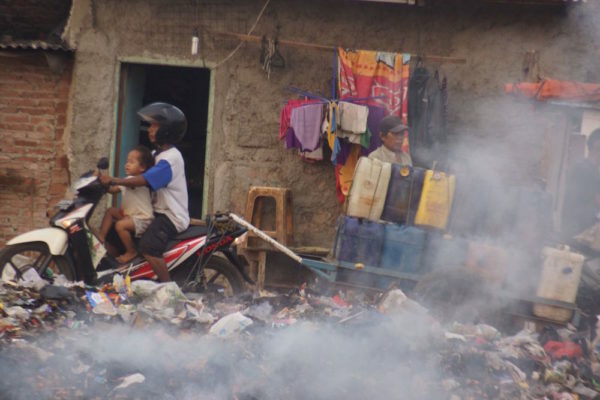 We leave early from our neighbourhood in the suburbs of Jakarta, a depressed area packed with makeshift homes where sewage flows in the open, and rats share space with humans. 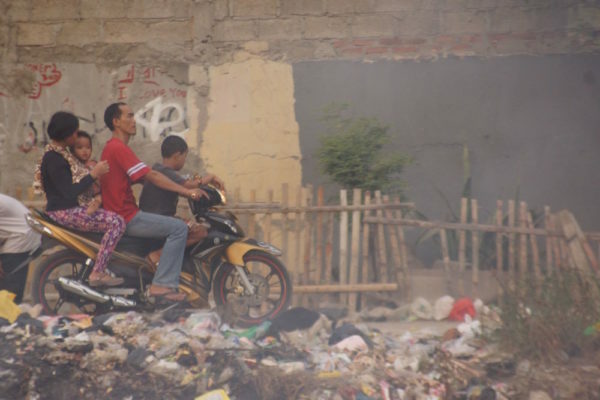 Hanging laundry and piles of garbage dot the area, until the first shops appear, taking a bit of the squalor away. We take a shortcut under a big grey bridge, which takes us straight to the first skyscrapers. Huge buildings with shining panes are surrounded by one-storey wooden houses where everything is done outside: Women wash their laundry, children play, men chat and smoke. I have a lot of time to absorb all the details. Some of the traffic lights in and around Jakarta last forever. Lots of bikers crowd under them and patiently wait for their turn to go. You can feel the stress mounting after a couple of minutes. In the heat it’s made even worse by the revving engines: drivers pump the gas, bikes inch forward, engaging in a tense battle to conquer a meter. I spend my time at traffic lights looking around. I love to see the patterns on the helmets – some are plain black or white, others have colourful designs that entertain my eyes for a while. I enjoy observing what other families on motorbikes do to kill time during the long wait. Children mostly sleep. Adults check their phones, chat with the neighbouring biker, smoke a cigarette or clean their nose and ears. All around engines fume and roar. Cars are kept behind. You see, motorbikes are like water in Jakarta, they naturally occupy all free space and adapt to the surroundings. So it is always an army of two wheels in front of and around cars. Cars are less interesting anyway. Most of them have darkened windows, which makes it difficult to see what goes on inside. Some traffic lights are more interesting than others because of the hawkers. It is fun to see new things coming up all the time – colourful feather dusters are my favourite, they come in bright blue, pink, yellow and green, and I would give an arm and a leg to be able to touch them and feel the softness of the feathers. At the beginning of the year, huge calendars are on sale, and after elections, the portrait of the president and vice president are at all traffic lights. I particularly love a junction where a little girl with a tiny blue guitar entertains drivers for a coin. Her mother moves from one car to another selling tissues, and the girl approaches the cars, barely reaching the windows, and plays an off-key tune. I can’t say if I am more envious of the sense of freedom she exudes, or of her bright blue guitar: I would do anything to have it. But I always look forward to the traffic light where we sometimes meet the foreign woman. The first morning I saw her I was strangely tired. I leaned against my mom’s back, and was not interested in what was going on around me. I could barely keep my eyes open. Through the mist of fumes I suddenly saw a woman in a nearby car watching me. Unlike like the other cars, hers had open windows. What struck me most though, was that she was different from anyone I knew. She was fair-haired and her eyes were blue. I shuddered and turned away. A few days later, at the same traffic light, her car was close to our motorbike again, her window open. She flashed me a huge smile and spoke to me. She was using my language, but I could not understand what she was saying. She said: “Saya dari Italia.” I had never heard that word, Italia, before. Plus, I was intimidated by how strange she looked, with her hair cut short and many different necklaces around her neck. One day, a full week after I had last seen her, her car was at our side. She was holding a little black box. I was scared. My mom must have felt my tension on her back, and turned to check. The woman talked to her in a different language, but my mom could not understand her either. Other bikers joined the conversation. 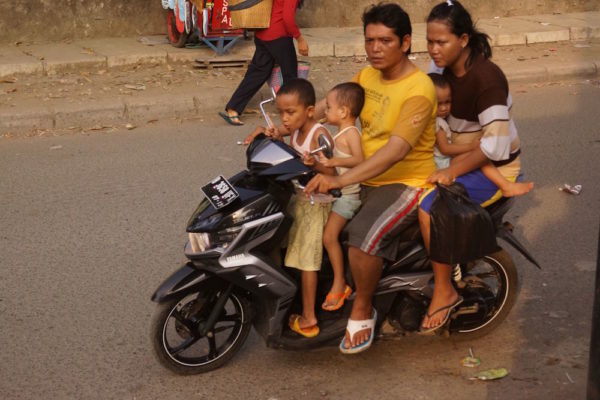 In a mixture of English, Bahasa Indonesia and lots of gestures, she explained that she was writing a piece to describe life on motorbikes in Jakarta, and needed to have a picture of a family on a motorbike. The box was called a camera and it was a machine that made pictures. She took one. My parents smiled and everybody around applauded. She’s not scary any more: I smile and wave every time I see her now. It makes going to school easier. I don’t like leaving my parents in the morning. My mom says that school can teach me a lot, but I know that nothing compares to what I learn when I travel through Jakarta on my dad’s motorbike.